Union players reported for the start of preseason training on Monday. To celebrate, the Union released images and a video of the new away kit the team will be wearing for the next two years. The team is sticking with white as the primary color but the blue in the sleeves (reminiscent, perhaps, of Orlando’s away kit), the stripe that continues down the side of the torso and in the collar detail give it some solidity, and I like the gold adidas stripes on the shoulder as well as the blue Union snake at the bottom of the front of the shirt. The monochrome badge is quite fetching and more streamlined than simply being a reversed version of the monochrome logo that was released a few years ago. The jersey will be available for purchase on Feb. 1. By the way, the jersey unveil video features Maurice Edu, Ilsinho, and Josh Yaro. Edu is moving freely and still shots from the video shoot appear to show him without any cast or protective boot while Ilsinho looks trimmer than we’ve ever seen since he joined the team. At the Union website, a social media roundup and video of players arriving for the first day of the preseason. Of course, the start of the preseason is also the start of the annual “Name the Trialist” fun. German news outlet Bild (crappy Google translation here) has already named one possible Union trialist, Fabrice “Fafà” Picault, the forward/winger who earned a USMNT cap last May under Jurgen Klinsmann in the friendly against Puerto Rico and is on the outs at St. Pauli. Bild quotes Picault’s agent, Alessio Secco, as saying “several MLS clubs” are interested in him with Philadelphia leading the pack. The Bild report says Picault has fallen out of favor at St. Pauli due to “lack of fitness and attitude” and, despite being under contract with the team until through June of 2018, has been exempted from training with the German club and told to find a new team (crappy Google translation here). Interesting Philly connection: Picault’s father played for the Philadelphia Fever in the old MISL (at least one game, anyway). ASN has a good article on Picault background and professional career. Jim Curtin and Earnie Stewart will be speaking to reporters after today’s training session so we should learn more about Picault and other trialists then. More on the Bild report at Pro Soccer Talk, Brotherly Game, and Section 215. At Union Tally, Matthew De George has five positional battles to watch during the Union’s preseason. At Brotherly Game, Jared Young is concerned about the Union’s spine. More storylines at Philly Sports Network. Section 215 on the reported (but as of this writing still unconfirmed by the Union) acquisition of Adam Najem. Union assistant coach Mike Sorber is included in a photo gallery at US Soccer from the first meeting of the 2017 Pro Coaching License course. You will recall Jim Curtin is a graduate of the first class. Union Academy defender Mark McKenzie (Bear, Del. ), and forward Justin McMaster (King of Prussia, Pa.), have been called up for the US U-18 MNT training camp at the IMG Academy in Florida, Jan. 23-30. Harrisburg have re-signed Jamaican re-signed midfielder Cardel Benbow “to a 2-year deal.” More at USLsoccer.com. At Brotherly Game, Matt Ralph talks to West Chester United head coach Blaise Santangelo about the team joining the NPSL. Earl Foreman, who once was an owner of the Philadelphia Eagles and advisor to Flyers owner Ed Snider as well as the co-founder of the United States Soccer League and longtime commissioner of the MISL, has passed away. In 1990, Foreman was named chair of the US Soccer committee organized to to establish a national professional outdoor league that was part of FIFA’s requirements for the US hosting the 1994 World Cup. That league was, of course, eventually MLS. CONCACAF has announced a new format for the confederation’s Champions League tournament. Or, as Soccer America puts it, “CONCACAF Champions League: new format, same old issues for MLS clubs.” More at ESPN and MLSsoccer.com. 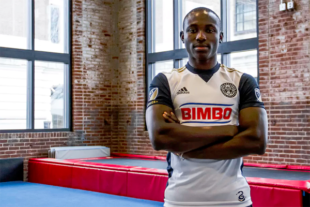 Former Union man Amobi Okugo has re-signed with Portland. Portland have also signed free agent defender Chance Myers, who played the last nine seasons with Kansas City. Portland also announced the return of winger Dairon Asprilla from his loan to Millonarios in Colombia. DC have signed 2016 MAC Hermann Trophy winner Ian Harkes (son of John Harkes) as the club’s ninth Homegrown Player. NYRB have signed academy product Dan Metzger to a MLS contract. The midfielder played the previous two seasons with NYRB II. Vancouver have signed 23-year-old Peruvian attacking midfielder/forward Yordy Reyna “with the use of Targeted Allocation Money (TAM)…through 2018, with club options for 2019 and 2020.” Reyna last played for Red Bull Salzburg. Colorado have signed free agent forward Alan Gordon “to a one-year contract…conditional upon Gordon passing a medical exam. Salt Lake have signed free agent forward Chad Barrett, who was with San Jose last year. Minnesota have signed local defender Brent Kallman, who played with the club in the NASL beginning in 2013, to a MLS contract. The club also re-signed Brazilian midfielder Ibson, who joined the club in 2015. Mix Diskerud is not included on NYCFC’s preseason training camp roster. Former Union man Michael Farfan is trialing with the club. Said Nick Stone, a partner in the FS Investors group that is behind the plan and that would own the MLS franchise, “There are a lot of people that were disappointed with that [the Chargers’ move] and understandably so. But we think this is a really, really interesting time to look at the opportunity to bring soccer to San Diego. It’s a very logical market for that. We can bring what is the world’s most popular sport, and the fastest growing sport in the U.S….One door closed but a really great door opened.” More at ABC San Diego and Fox Sports. Bringing Major League Soccer to St. Louis always hinged on the Board of Aldermen and city voters, but now it likely will involve a judge. As Tuesday’s 10-week deadline expires for the Board of Aldermen to approve propositions for the April 4 elections, soccer supporters hope late action by the board will save the proposal. If the board passes the public funding proposal, the city has until Feb. 21 to get a circuit court judge to put it to voters, according to state law. Charlotte Business Journal reports, “Charlotte City Council opted against a previously planned closed session to discuss a $43.75 million investment in a pro soccer stadium on Monday night, but declined to debate the matter after hearing details of the proposal as part of their regular meeting. Mayor Jennifer Roberts, echoing the deputy city manager who helped negotiate the terms, recommended council members email any questions they have over the next few days to city administrators before a scheduled vote on Friday afternoon…County and city tax money would account for half the construction cost of a proposed $175 million, 20,000-seat stadium”. More at The Charlotte Observer. WBTV reports a public hearing on the proposed stadium in Charlotte will be held on Wednesday. Kellyn Acosta (left ankle sprain) and defender Matt Hedges (right knee sprain) have left the USMNT training camp, as has Kekuta Manneh (who has not yet been cleared by FIFA to play for the US after recently gaining US citizenship), who is departing to join Vancouver for the Whitecaps preseason training camp in Wales. Landon Donovan says the current USMNT pool is the most talented the team has ever had. Could the 31-nations of the Caribbean Football Union be about to breakaway from CONCACAF, leaving CONCACAF with 10 members? South American Football Confederation (CONMEBOL) President Alejandro Dominguez has been appointed as chairman of the FIFA Finance Committee – despite the organisation’s involvement in the widespread corruption scandal. The previous three heads of the CONMENOL – Paraguay’s Nicolás Leoz, Eugenio Figueredo of Uruguay and Leoz’s compatriot Juan Angel Napout – have all been indicted by the United States Department of Justice. Two things: First, As much as I love the game, public funds should not be used for stadiums of any kind. Welfare for the Uber- rich is sickening. Secondly, No offsides rule would ruin the game. I can’t imagine the game without the offsides rule. It would pretty much destroy the concept of the high press. Again, beauty of the sport is that it works so well with so few rules and has not needed a lot of tinkering for 150 years. Let it be. It works. Removing offsides would make it a completely different game. If they are concerned about the accuracy of it, maybe open it to video review. It would take about 5 seconds to review and get it right. Neither will happen. Won’t be removed, and they won’t use replay. I like the concept of a “intermediate” type card to keep the reds to a minimum.. but.. The offsides rule forces alot of the beauty of the game, perfectly timed runs getting perfectly weighted passes behind (nearly) perfectly positioned defenses. I don’t hate the new kit except for the gold stripes on the shoulders… I really hate that. gone is the Charmin! rejoice! Real question.If we go into the season as-is, regarding the roster, with possibly 1-2 minor signings. Is everyone happy? Depends on wether the new LB is opening game starter. Depends on wether new striker is opening game starter. Depends of wether Maurice Edu is first month starter. I disagree with the LB, but the rest are true. Although I would like 1 big midfield signing. So I would generally take your tone to be as generally meh, slanting towards unhappy. Incomplete seems to be the consensus. Union fans are never happy. But the team are what they are. It looks like Edu will be back. Our younger players will hopefully continue to develop. Maybe Ilshino and Alberg will be fit, happy and adjusted to the league. Possibly our strike force can put away some goals. And God Willing Brian Carroll can maintain a fresh supply of virginal blood to keep on playing. Thats a lot of If but if it all happens we can have a fun team that will win some games and get into the playoffs. Seems like many maybes for a team that was on the edge of the playoffs last year, trending downward. Edu at (close to) full strength is a big upgrade. A proven wing would have helped the most I think. I tend to lean glass half full. I’m optimistic about Simpson, Wjinaldum, and co. and will be so until evidence proves me wrong. In general, my optimism is predicated on my belief that Stewart knows what he’s doing. It’s worth remembering this team was started from scratch in the truest sense of the word scratch. We might not get a real DP name signed, but Stewart is doing all the work to make sure the gaps in the whole organization are filled and that we’ll have an academy that can produce talent. That is what he promised. I think he deserves our patience. In general, is a DP needed to succeed? By succeed I mean win the championship. I feel like the league is trending toward the DP types mattering more. Honestly, I don’t know. I think that we looked like a very capable team that could have made a playoff run (although the cup was unlikely) until Nogs left. His departure completely destroyed the foundation of the team. Now, that says something else that one person could have that much of an adverse effect, but that’s a conversation for another time. I am always against panic buying. Is CJ the backup? If so, that’s a pretty good sign that someone knocked him out of the lineup. Is Mo healthy? Then he can be a major cog (despite the ongoing pessimism among the fan base). Is Yaro healthy? Those are 3 important questions, and none of them require a leap of faith. Last year I wanted to make the playoffs. Mission accomplished (as ugly as it was). This year, I want a playoff win, preferably accompanied by a top 4 finish in the regular season. I think this squad has the potential for that, especially if the young players like Jones and Najem (speculative) can deputize without us losing a lot of quality. I would tend to lean glass half full, although I am slightly unimpressed this offseason so far. I conceded that we were what we were as the year ended last year, with trust in ES to guide us into this year. I’m not sure we made great strides, other than the youth gaining more experience. The other issue is that the other teams are improving as well, so much of the growth is relative. Let’s compare that to the starting lineup from the end of last season, when we took 2 points from our last 8 – it’s basically Yaro in for Tribbett, Edu in for Barnetta, and maybe Simpson in for Sapong. Are any of those impact changes? No. And that’s relying on Edu to be healthy and high quality from the get go after not playing for over a year. If you’re the type who is happy with a playoff appearance and a first round exit, that’s the Union’s current highest possible upside. If you’re the type who looks at the Union as a team who got lucky through the first half of the season and somewhat predictably turned into the worst team in the MLS in the second half, well, it doesn’t look promising, does it? You may call my expectations too low, but bringing in a couple of small names and banking on them because “EARNIE IS TEH GREATEST! !1!” seems, quite frankly, ridiculous to me. Are you expecting us to pry Ibra away from Man U? For those clamoring for a some type of deus ex machina, what exactly do you need to see in order to feel any optimism? The team is being rebuilt around youth. No one involved has shown any inclination at any point in their careers to spend big money. So, the question becomes, what do you want to see? Do you need us to bring in someone like Aron Johanson and play a 2-striker set? Or do you need us to find some Nogs-like midfielder that no one has heard of until he shows up here? It’s ok to be frustrated, but this is what it is, and they will continue to build through BSFC and the Academy and hope to plug holes with some inexpensive signings. I mean, I laid out my offseason plan pretty clearly at the start of the offseason. 1. Firmly replace Carroll and Creavalle. 2. Get a real striker in. 3. Bring in a quality CB so that we don’t end up in a situation where we have to rely on a guy like Tribbett. 4. (preferred but optional) Bring in another midfielder like Nogueira. Seeing 2 of these would have brought me some optimism. 3 would have been ideal. 4 would have me jumping for joy. We’ve hit…0.5? Charitably 1 if you really want to go high on Simpson? The problem isn’t the “rebuild around youth” thing. The problem is that we appear to be stockpiling a bunch of similar attacking mids at the expense of everything else. Jones and Trusty are nice prospects, but does anybody expect them to make an impact this year? And I say this every year, but building through the academy doesn’t work in MLS. No, FCD is not an example of it working, FCD is an example of a team bringing in high impact internationals and allowing them to play under an elite coach. Sure, the guys they drafted and brought in as HGP provide some support, but those top guys brought in from the outside do the heavy lifting. And, uh, we do NOT have an elite coach. What I am expecting is a team built for the unique circumstances and challenges presented by a league that is developing and improving at a rapid rate. What I’m getting is a team that in 2-3 years will be good enough to compete for the MLS that existed in the past. 2 = Why isn’t that Simpson to you? 3 = Do you mean you want Yaro to start, and you want a quality CB depth option? That’s fine, but thats not a make or break thing to me. 4 = This is where they are probably happy with Alberg and Bedoya for now, with the expecation that Jones and Nemec grow into that role by the end of the year. And I’m ok with that too. 1. Are we playing Edu and Bedoya as the two back mids? Otherwise, either Carroll or Creavalle is playing. And that’s assuming Edu’s health, which, lol. 2. Because Simpson has never been good, like, not even close to BWP’s level, and couldn’t even get off the bench or make an impact in League Two? Not to mention he’s a bad fit as a target striker. 3. No, I mean I want Yaro to be the backup and a real starter next to Marquez. I think you are being slightly more negative than you should be, but your points generally make sense. I don’t count on players from last year to be suddenly largely improved, with the exception of the younger players like Yaro, Rosenberry, Blake and Herbers. That said, you can onyl rely on that growth so much. Only way I would be happy with the team as is, is if they change formation from a 4-2-3-1 to a 4-4-2. And this only works if all are healthy. Otherwise no I am not fine with the team as we have no spine for a 4-2-3-1. Basically we have exchanged Noegueira and Barnetta for Winjaldum and Simpson so far from last year. Those are yet to be seen, but I would say they are at best a wash. We have to really hugely count on big leaps from young players. That’s not true. The plan is clearly to replace Barnetta/Nogs with Bedoya/Edu. A LB and ST have nothing to do with the midfield. I have to concur with Adam S. on his “hell no”. We need another central midfielder. I am perfectly happy with Creavalle and Carroll as backups, but we need another starter. Right now we have Bedoya, Edu, and ??? Unlike many here, I am very happy to have Mo Edu back in the starting lineup, as he is a very talented player in a position of need for us. Unlike many here, I am NOT happy with Roland Alberg as a starter. The man is not a midfield in any capacity; he is a poaching striker, and belongs on a team with a 2-striker set. Maybe you could put Ilsinho at CAM??? I could potentially see that working, given his passing and dribbling skills. But then who starts on the RW? I like Herbers a lot, but we can’t rely solely on him. And Sapong is a target forward, not a winger. Then there’s the issue of lack of CB depth. I could be generous and say that maybe a veteran CB to mentor and backup Yaro while he develops is one of the “1-2 minor signings” you mention, OK, fine. But even still, this is probably not a playoff team, never mind an MLS cup contender. I agree a #6 (or #8 I don;t care) starter is necessary. We could also use a backup CB and GK. And I think a winger would be useful too. My Dearly Departed is simply too good not to play in this league so here’s hoping his career rightfully stabilizes. I think the new kit is terrific. Agree. I was happy to read Amobi’s tweet about signing with Portland. And the new kit looks great. Based on Portland’s off-season moves, I think they’re going on with the approach that Okugo will be starting. I think he rights the course this year. Good to see Mo in good spirits. I really hope he is a full participant by the end of preseason. I know. Spare me the diatribe. The only thing I can think that might help Edu play is the fact that I think he is in a contract year so that might change how soon he gets on the field. I think your opinion of this is way off base. Stress fractures are tricky beasts and it’s honestly ridiculous that you think he didn’t want to be out playing last year. I never said he didn’t want to be out playing. However I think he was held out unnecessarily at times. I think overall Edu did a poor job of rehabing the injury and I do put that on him as he should be able to know when he should push things and when he shouldn’t. For example if you are recovering for a prior injury probably not the best to go out training like he did the beginning of last season resulting in his stress fracture. Eh. While I do partially agree, stress fractures are what they are. I don’t believe that you can blame them on anything other than bad luck. It’s as much on the training and medical staff as it is on Edu. In modern pro sports, rehab regimens are carefully scripted and monitored by the medical staff. If he pushes it too hard in training, it is on them to reel him back in. To that I say then Edu has to listen how many times did we hear of him playing at BSFC and they said were giving him 45minutes. And Edu said no and just stayed on the field. I can remember at list 2-3 times at the end of the year. And the initial injury was cause before preseason when he wasn’t suppose to be training anyway. Maurice Edu played three times with the Steel, all in September, Labor Day weekend Sunday home to Red Bulls 2, the next weekend away at Charleston where 45 minutes became 90, a week where he sat the bench for the Union but got no minutes, and then the penultimate game v. Pittsburgh where he came off within a minute or two of the scheduled departure. That’s all memory. My 2016 spreadsheet is archived. From a World Cup qualifying standpoint, the Caribbean nations splitting doesn’t make sense currently as it would be tough to make a case for them to get more than 0.5 berth. However, it probably does make sense once the World Cup expands since then they would probably get a berth or two. I love the concept of a ten nation federation separate from the Caribbean. No minnows. And a majority can be secured without half of its number being minnows with their mouths open for bribes. A well reasoned and rational approach to planning for pro/rel in the US by Peter Wilt. Onyewu is training with the team. Interesting. It would be better if this was 10 years ago, but he would be an interesting veteran presence. Apparently it’s just for fitness and not necessarily a trial, but still intriguing. I would take Onyewu in a heartbeat. Yes he is not what he once was but the ability to have size and a veteran presence in the back 4 would make a world of difference. Plus he is the right type of mentor for some of these young guys. It’s mainly the mentoring part that intrigues me. At 34, the game may be getting tougher on him, but he has been through enough to help the young guys. He’s out of contract and not in high demand. I’d be curious if they could pull him in at a reasonable price. price would not be the issue, I would think. Is it the best use of the roster slot given the needs in the center of the midfield that remain unaddressed, unless they are placing some amazingly huge and risky bets on youth, huge. But with the presence of Onyewu it just to me opens up so much from the back. You no longer have to necessarily sheild a young back 4 with Brian Carroll. It opens possibilities. If they moved on it and brought him in I think it then allows you to move someone to BSFC likely Trusty to play on a regular basis. You then have backups for both Marquez and Onyewu in Yaro and Tribbett. Two people in every position as the SD says. To me it allows more flexibility in the players you are looking to fill the midfield role. please, try to get this Disney style mentoring garbage out of the conversation. It is possible he, like many pros, has not enough understanding to mentor anyone. Get him only if his playing helps the team directly. The young guys need help by the coaching staff, not from some old pro. Lets get real here. A no brainer…. yup. Heartbeat. According to the beats on twitter, Stewart’s “Controlling Midfielder” verbiage is referencing a #6. Also said that they are looking for a CB. The lack of international spots won’t be an issue because it’s easy to open them up (and sounds like a green card is imminent). Najem is only a trialist and viewed as a 10. Fafa Picault is also a trialist, a winger and they like his speed. Edu should be cleared to run in early January. I find the Najem thing interesting. Is that just coach speech? Why would you trade for his rights if you were still not sure you wanted him and only took him on trial? Considering the price tag you have to assume he’s demanding as a rookie, I would imagine that Stewart has a greater vision for him than just a trialist. But since no deal is done, they’ll be careful with their words. Maybe the trade has a condition of him making the team and being signed. Otherwise he could sign outside MLS or wait and enter the draft next year. Do you mean February, we all hope? Yes. Seems I am behind a month. Edu is apparently walking around fine and should be cleared to run early FEB. I trust this more than last year too because a legit break is much easier to estimate than a stress fracture in my experience.